Release month is just a guess, but was around the time i 1st saw it. Ok, the addition of this prod means that I *must* download winuae now! It's another one of those rare prods that was long forgotten but much loved by the TWO people that saw it ;p well 3 if you include my brother. Works on vanilla A500 not A1200 and didn't work on winuae. The file linked above seems to contain a wrong demo (by "Deacon"). 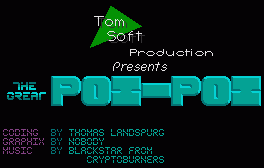 The real "Poi-Poi" can be downloaded here. Oh, and it worked fine for me using the newest WinUAE (kickstart 1.3 and 1 MB chipmem). just kept crashing no matter what chipset/cpu setup i used and what kickrom.. Worked for me, but I didn't think as highly of it as some here. Perhaps cos I missed it the first time round, so it hasn't got the nostalgia factor. Nice, I really liked the vu-meters history with real-time vu-meters in the scrolltext. page created in 0.016163 seconds with 15 queries.